Here is 2 ½ year old Rosalie Légaré. She was diagnosed with cerebral palsy and a lack of myelin in the brain. She also suffers from visual impairment, a lack of muscle tone ( hypotonia ) and an eating disorder which affects her development. Rosalie is still unable to sit, stand up or even talk. Her brain is actually considered to be paralyzed, as such, it does not always send the right commands and the lack of myelin greatly reduces the speed at which these commands are sent to the rest of her body. In addition, she is no longer able to feed herself normally and has been operated so she can be fed through a catheter. Despite her age, Rosalie still does not sleep through the nights and sleeps very little during the day. Since the day she was born, Rosalie has taken part in numerous rehabilitation therapies (estimated at $680 / month) as well as hyperbaric chamber treatments (oxygen therapy). The latter of the two alternatives is very expensive (over $20,000 to purchase), but this treatment has helped her make the most progress in the least amount of time (49 days). We are fortunate to be officially sponsored by the SOS Handicapés organization. They have helped kids like our Rosalie for 12 years. They are able to issue tax receipts for those who desire. They have also promised to donate a small amount towards the purchase of the hyperbaric chamber (the amount of the taxes). So to say that they believe in Rosalie’s potential. Be assured that all of your donations will be going to the right place and will be safe for the wellness of out Rosalie. Since she was 3 months old, up till her 2 years of age, Rosalie was able to enjoy therapies offered by public healthcare. Unfortunately, despite their good will and relentless work for Rosalie, their conventional methods led to very little progress, except for her eyes which have shown significant improvement. As such, fallowing the progress achieved with the help of the hyperbaric chamber, she has started to go back to vision therapy. Rosalie started going to therapies with private therapist at 2 years old. She has since gained more muscle tone with the Medek Therapy in 3 months then she has with the exercises from public healthcare in 1 year and a half. We can see a great improvement, but she must continue for her to be able to sit up on her own. Rosalie has also started the Padovan Method which is a therapy that helps with target recognition. The oxygen treatments in the hyperbaric chamber have allowed her to express herself. She now babbles daily, more so then before, and makes new sounds. She is also a lot happier and giggly which also helps us keep our hopes. She’s now more interested in her surroundings, she started touching objects more and more and seems more conscious of the actions and reaction of her toys. Other families in the same situation have found major progress in motor, language and cognitive skills from these treatments, which give us hope for our Rosalie to have a bright future. Give her to chance to continue her treatments. 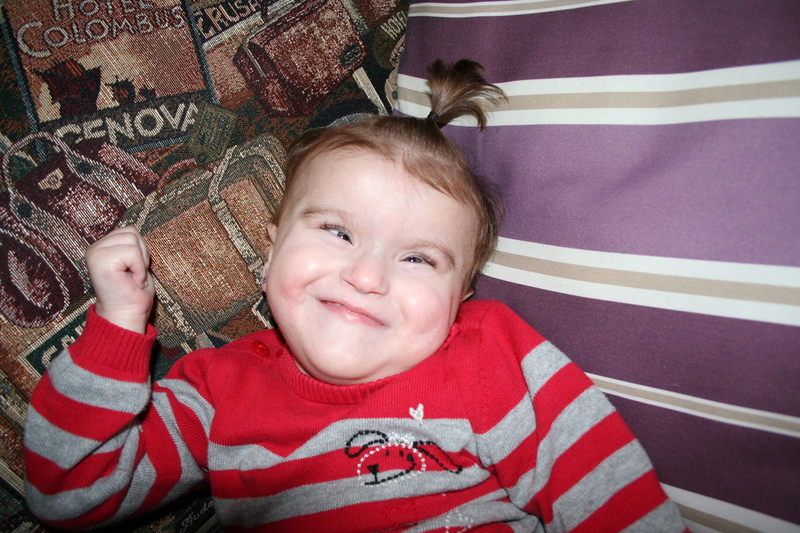 Help Rosalie and give her a chance to improve her capacities and her quality of life. Please make your check out to “SoS Handicapés inc.” and by writing Rosalie’s name at the bottom left (memo) line.